When her daughter, Melissa was 2 ½ years old, she became very interested in cooking and having stories and poems read to her. Diana combined the two desires and wrote a storybook/cookbook. Diana believed that even young children could learn about nutrition and enjoy eating many kinds of foods if they helped prepare them. She developed a story about the nutrients and skill lessons to help Melissa learn basic cooking skills. Diana created a poem for each nutrient and for each recipe. She would read the poems to Melissa and then they would prepare and serve that recipe. Melissa’s younger sister, Juliana, would watch from the sidelines, being too young to participate. However, as Melissa and Juliana grew older, and the family moved several times, the cookbook lay almost forgotten. Diana was busy with other endeavors. It would be her daughter, Juliana, an award winning graphic artist, and her granddaughters, Mara Belle and Ella Jane who inspired Diana to revise and publish the book. 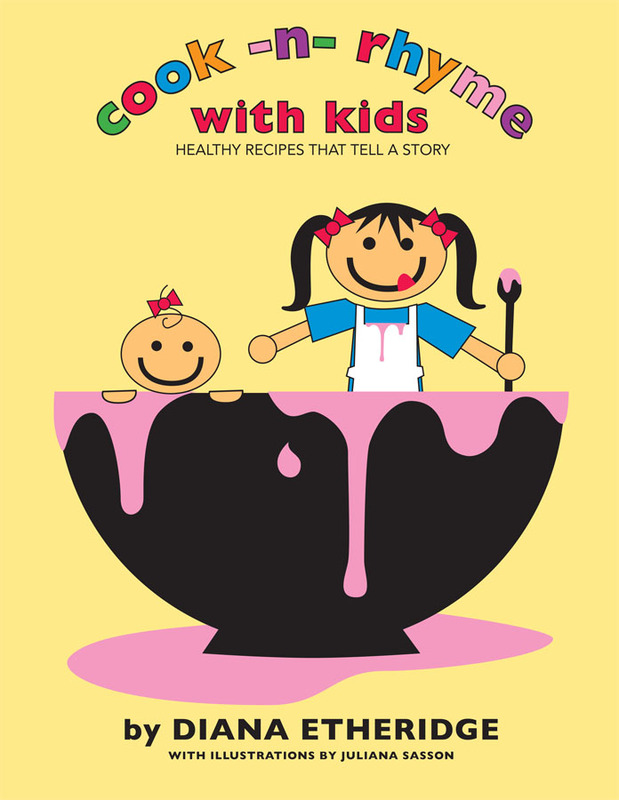 Juliana designed, illustrated, and prepared the Cook-n-Rhyme with Kids for publication. Mara and Ella loved the stories and poems and loved to help their mother, Melissa cook the recipes from Nana’s book. Diverse interests have motivated Diana Etheridge all her life. She received her BA Degree from the University of Denver and her MA from Simmons College, Boston. She has travelled and studied abroad. She enjoyed careers as a teacher in public and private schools; as an editor of MY HAWAII by Jane Thomas; as a published poet; as a real estate agent in a variety of locations. She is a patent holder of a building process (http://www.flexystems.com); president and founder of EDEA™ the idea clearinghouse® (www.edea.com) ; and of CYBERNASTICS®, Inc. (http://www.cybernastics.com), a web-based exercise site. She’s found time to have a successful marriage and be the lucky parent of two fine daughters.